Dario Robleto: Ancient Beacons Long for Notice is the McNay’s first major presentation of artworks by Dario Robleto, a San Antonio native best known for his installations of carefully collected and crafted objects. 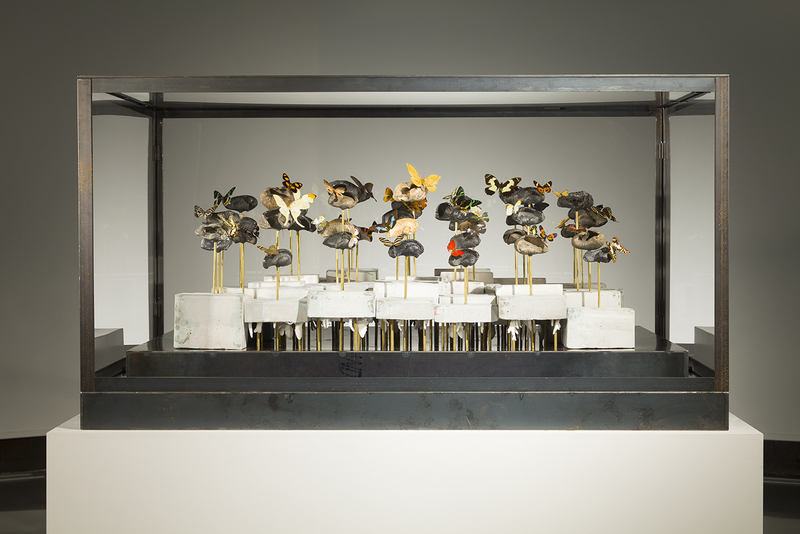 Robleto’s assemblages are meditations on love, death, mourning, and American history, reinforced through the artist’s passion for astronomy, biology, and psychology. For example, Robleto’s American Seabed (2014) is the result of his interest in sound and its physical manifestations. The sculpture comprises a wide variety of objects, including fossilized whale ear bones salvaged from the sea. This exhibition offers viewers an opportunity to see works from throughout the artist’s career, and helps contextualize his most recent endeavors. Dario Robleto currently lives and works in Houston, Texas, and in 2016 was appointed the Texas State Artist Laureate. This exhibition is organized by Rene Paul Barilleaux, Head of Curatorial Affairs, and Jacqueline Edwards, Assistant Curator, for the McNay Art Museum. Lead funding is most generously provided by the Elizabeth Huth Coates Exhibition Endowment and the Arthur and Jane Stieren Fund for Exhibitions. Image: Dario Robleto, American Seabed, 2014. Fossilized prehistoric whale ear bones salvaged from the sea, various butterflies, butterfly antennae made from stretched and pulled audiotape recordings of Bob Dylan’s “Desolation Row,” concrete, ocean water, pigments, coral, brass, steel, and Plexiglas. Courtesy of the artist and Inman Gallery, Houston, Texas. Photograph by Jason Dowdle.